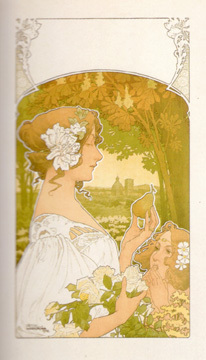 "The woman and her child admire the beauty of a garden, shown behind them in subtle earthy colors, landscaped by the nursery company named on the completed version of this poster with letters. A prime example of one of Art Nouveau's precepts: a reverence for women, always shown in the best possible light." Note the thin, halo-like white outline around the ladies' profiles, one of Livemont's special touches.